The cabinet approves the nominations of engineer and educator Óscar Ramírez and corporate lawyer Ricardo Arango to serve on the Panama Canal Authority board of directors. Photo by by the Presidencia. 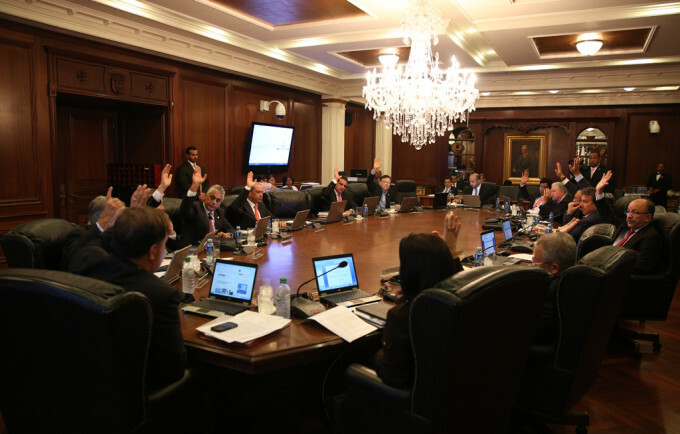 On March 22 President Juan Carlos Varela nominated Óscar Ramírez and Ricardo Arango to serve eight-year terms as members of the Panama Canal Authority board of directors. The nominations must be ratified by the National Assembly and it appears that there will not be any problem with that. Ramírez, the rector of the Tecnologico (Technological University of Panama, the Universidad Tecnológico de Panamá or the UTP), is a UTP and SUNY-Buffalo educated engineer whose research and teaching has specialized in structural engineering for earthquake resistance. His doctorate from the State University of New York at Buffalo — for which he was assisted by a Fulbright scholarship — is in structural and seismic engineering. The UTP has its origins in the engineering department of the University of Panama seceding over campus politics and low academic standards. Led by Dr. Víctor Levy Sasso, the engineering department gained a measure of autonomy in 1973 and an independent charter in 1981. Although it was a US military target in the 1989 invasion — American soldiers arrested Levy and although he was never accused of any wrongdoing he was stripped of his job and the car and other possessions that were seized by the US Army were never returned — the university continued on its independent way, growing to its present seven campuses and gaining a reputation as Panama’s academically best institution of higher learning. After the brief invasion interregnum Héctor Montemayor was elected rector and served in that post from 1991 to 2003. Salvador Rodríguez succeeded him and in 2009 Marcela Paredes de Vásquez became the first female rector of any Panamanian university worthy of the name. Ramírez, a native of Gualaca in Chiriqui province, was elected rector for the 2013-2018 term. During the canal expansion work, the previously known Pedro Miguel Fault, which crosses the canal, was found to be a bigger and more active threat than was thought. There has been some thought about measures to strengthen the canal’s earthquake resistance, with one worrisome scenario being an event that breaches the Pedro Miguel Locks. Were that to happen Gatun Lake could empty out through Culebra Cut and the broken locks. It would take years for the lake to refill. One possible emergency response system would be strategically placed explosives along Culebra Cut that would cause landslides that dam up the cut to keep the water in. It’s an engineering problem fitting Ramírez’s specialty, expertise about which is otherwise missing on the ACP board. Ricardo Arango, son of one of the prominent Creole families, has his undergraduate degree in law from the University of Panama and master’s degrees (LLMs) from Harvard and Yale in corporate law and financial law respectively. Part of his US studies were also on a Fulbright. A partner in the law firm of Arias, Fabrega & Fabrega, he is on the boards of directors of Panama’s scandal-plagued Bolsa de Valores stock and bond market, Banco General, the Latin American Export Bank (BLADEX) and the La Prensa newspaper. Arango represents continuity on a scandal-plagued ACP board dominated by construction people (including Alejandro Moncada Luna’s alleged money laundering and bid fixing partner Nicolás Corcione), people in the maritime services sectors other than shipping itself, bankers and corporate lawyers. No PanCanal retiree or employee has ever served on the board since Panama assumed full control of the canal. A number of political appointees have, mostly people who had been involved in the negotiations over the waterway’s transfer from US to Panamanian administration. The problem with continuity is that while La Prensa and the banks were deeply involved in the largely state-funded 2006 “yes” campaign based on many questionable premises, the financial plan for the canal expansion that was sold to those voters who showed up has been a failure from the start. This has never been acknowledged, and indeed you will find few in the ACPO or at La Prensa who will now admit that their projection was an increase in US imports from Asia to increase geometrically by the rate of increase in those between 2000 and 2005, through 2025. That would have meant that by now all US industrial production would have been exported to Asia but US wealth and purchases of Asian goods would still be climbing on a nearly vertical path. That didn’t happen so the ACP borrowed money for an expansion that had been billed as “self-financing” and ship tolls were raised high enough to prompt some shippers to move to other routes. If the new locks work — if not they will be adapted at whatever cost so that they do work — PanCanal finances will still be a mess and toll revenues won’t cover it. Thus we have the ACP seeking to get into the ports, oil pipeline, fossil fuel electric generation and other business because the institution needs new revenues to stay afloat. But this has set off rumbles among various interested parties, and has not gone down well with governmental institutions like the Panama Maritime Authority that would have the ACP grabbing some of their turf. So does Banco General get a new interlocking directorate with the Panama Canal Authority? That would tend to indicate that if a new port is created under ACP auspices at Corozal and Diablo, the concession will go to the Mottas.